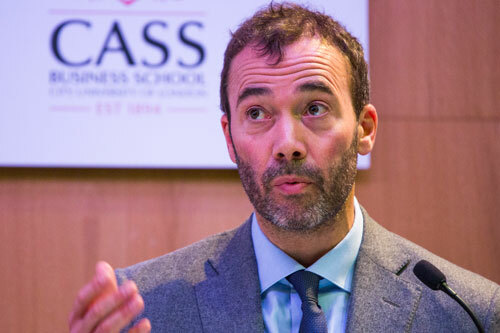 William Lewis, CEO of Dow Jones and Publisher of the Wall Street Journal, delivered an exclusive lecture on leadership at Cass Business School on Thursday 22nd March. Mr Lewis reflected on his own leadership journey and emphasising his belief that encouraging diversity is essential to leading a successful organisation. He also spoke of the importance of knowing yourself, being curious, and sticking to your principles. Mr Lewis, an alumnus of City, University of London’s prestigious Department of Journalism, was at Cass to formally launch Lessons in Leadership - a certified series of online masterclasses produced by Dow Jones and Cass and the first online learning collaboration between a major media organisation and a leading business school. Lessons in Leadership is a 16-week programme offering nine individual masterclasses that combine video content provided by Cass academics with real-life case studies - drawn from conversations that William conducted with leaders of major global businesses. Interviewees included Muhtar Kent, Chairman of Coca-Cola; Barry Stowe, CEO, Prudential; Inga Beale, the first female CEO of Lloyds; Jo Ann Jenkins, the first female CEO of AARP and Richard Edelman, CEO of the world’s largest PR consultancy, Edelman. Mr Lewis said successful CEOs tended to focus on ensuring their organisations are instilled with a compelling sense of mission and direction and that resources are deployed to support that – but that perhaps the most important part of leadership was ensuring you had the right people in place. “Perhaps the most important role of being a good CEO is making sure you have the right people – with the most diverse backgrounds – in the most important jobs inside the company. I can tell you from personal experience that the more diverse a culture, the better the ideas and the increased likelihood of success. “If you can get all that right, while still safeguarding the heritage, values and soul of the company you are leading, you are well on your way,” he said. Mr Lewis spoke about the importance of learning from millennials, something which was echoed in his interview with Tech Mahindra CEO, CP Gurnani. Mr Lewis said that not all CEOs had followed a straightforward career path, adding that Joe Jimenez, until recently the CEO of Novartis, felt that young people should avoid taking a linear career path and instead seize opportunities to learn new skills and take on new assignments. 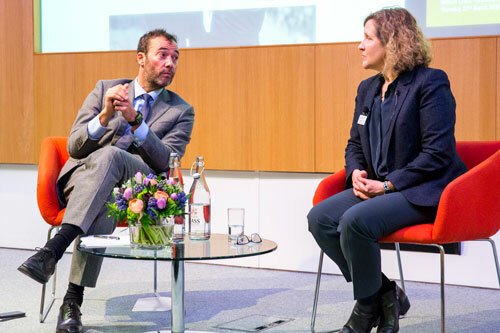 Speaking at the event, where she chaired a Q&A with Mr Lewis after his speech, Professor Marianne Lewis, Dean, Cass Business School, explained how Lessons in Leadership was devised. “A highlight of the 50th anniversary of the Cass Business School two years ago, was the then Coca-Cola Company CEO and Cass alumnus Muhtar Kent’s interview with William and me, about the lessons he had learned during his career. “The exchange with Mr Kent, now Chairman of the company, was fascinating in many respects - from his start working on Coca-Cola trucks as part of the management training programme to his rise through the ranks, leading operations in the former Soviet Union and other regions across the globe. But one lesson in particular stood out for both of us: his emphasis on the importance of being humble. Professor Lewis said at the same time at this she was also lucky enough to meet the entrepreneur Peter Price, of PTwo Publishers, who had experience of developing novel online education in the US. Read a transcript of William’s speech here. Find out more about Lessons in Leadership here. William was appointed Chief Executive Officer of Dow Jones and Publisher of The Wall Street Journal in May 2014. He previously served as Chief Creative Officer for News Corp, the parent company of Dow Jones, where he was responsible for the company’s creative strategy and developing new commercial opportunities. Prior to joining News Corp, he served as Editor-in-Chief of Telegraph Media Group, which he joined in 2005. Under his editorship, The Daily Telegraph was named UK Newspaper of the Year in the 2010 British Press Awards, following exposure of the parliamentary expenses scandal. He was also named Journalist of the Year. William holds a Bachelor of Science degree in Politics & Economics from the University of Bristol and is a graduate of City, University of London’s Periodical Journalism postgraduate degree.